focused on a bundle of entangled practices emerging around the work of the New York City-based Judson Dance Theater (1962-66) – the sixtieth anniversary of which was celebrated in New York in 2012, presenting the work of many Judson-era artists including Meredith Monk, Yvonne Rainer, Steve Paxton, Carolee Schneeman and subsequent postmodern dance practices in New York and elsewhere. Thurston also practices Five Rhythms and Contact Improvisation, and uses their movement vocabularies and improvisational techniques in the composition and the performance of his poetry. Scott Thurston and vocalist Steve Boyland in performance. JR: How would you describe your literary practice, your poetry? ST: I guess I’d start by mentioning that my first contact with poetry as a live art form was at the Subvoicive poetry reading series (then run by Gilbert Adair) and Bob Cobbing’s New River Project workshops (aka Writers Forum workshops) in London in the late eighties and early nineties. I owe these encounters to Robert Sheppard who became my mentor throughout my teenage years, eventually supervising my PhD in my twenties! The first poet I ever saw read was Maggie O’Sullivan, quickly followed by Bob Cobbing performing with Bill Griffiths and Paula Claire as Konkrete Kanticle. These experiences set me on a particular path which I’ve been following ever since, inculcating an awareness of language as material, tensed against the history of poetry and its socio-political context in the present. I’m interested in finding new modes of expression for all the old human stories, if not innovation for its own sake. Experimentation is a fundamental part of my practice – although improvisation might be a better word for it – but some of my poems feel more experimental than others! JR: How does that align with your perception of physical movement and gesture? ST: When I interviewed Bob Cobbing in 1993 he spoke about the importance of bodily movement in both making work and performing it. I started clubbing in my teens and attended various all night dance parties in London as well as some large-scale raves in Wiltshire in the nineties, but it wasn’t until I discovered Five Rhythms in my early thirties that I was able to bring my attention to my dancing in a different way. In short I rediscovered my moving body as a source and site of creative thoughts and experiences and a much wider range of movement possibilities than I’d ever imagined. Five Rhythms also encourages work with partners, trios, small groups and the whole group, and the dynamics of these situations just became so fascinating to me, and hugely beneficial for my development (1). Almost from the start of practising Five Rhythms I also had experiences that resonated with my encounters in reading and writing poetry, and experiments began to burst out of me in various attempts to process these experiences and find formal devices apt for the task. I sensed a resemblance between the rhythmic, sonic and intellectual movement of poetry with the dynamics of physical movement – that a sequence of improvised movement could have a structural integrity to it akin to a line of verse, and, like verse, could also lead me to the discovery of new meanings about myself, others and the world. JR: You’ve written about gesture theory. Could you summarise what that is and how it works into poetics, if at all? Noland’s sense of gesture as a way of investigating both the radically inventive, embodied aspect of meaning-making and the way in which textuality is de-, re- and transcribed on, off and in the body seemed a rich dialectic to use when thinking about my own experiences of both movement and writing (2). Since then I’ve been using the psychologist Daniel Stern’s concept of vitality dynamics to think more about the collaborative work I’m doing and how there seems to be always something ‘behind’ both words and movement that might be the common source for artistic work, and that might enable a presentation which makes use of the consonances and dissonances between how different art forms capture those same dynamics. I think this was what Merce Cunningham was fascinated by in his collaborations with John Cage, Robert Rauschenberg and Jasper Johns: the independent, unplanned interactions between the dynamics of movement, sound and light in a given performance. JR: I know you are particularly interested in the book of dance-instruction poems written by the poet Jackson Mac Low titled The Pronouns: A Collection of Forty Dances for the Dancers. Can you talk a little about that book and how it affects your work? ST: I think I’d known about the book for some years, as I did of Jackson Mac Low’s work generally, but my first proper reading of it coincided very happily with learning of Clarinda Mac Low’s intention to do the first full performance of the book over three nights at the Danspace Project in New York in 2012. I got a chance to talk to Clarinda online before the performance and then had a long conversation with her about the project after the show (3). The performances were absolutely amazing and totally re-wrote my reading of the book. As soon as I got back to England I started preparing my own version of a treatment of one of the poems and it took me about two months on and off to come up with something I was happy with. I did perform it, along with a few other related pieces, in the Liverpool Improvisation Collective studio at the Bluecoat Art Centre in late 2012. I think what I loved about the book will now be forever intertwined with both those performances – its openness, playfulness, sensitivity to the possibilities of language inspiring movement. It’s one of three pillars that support my present enquiry – Simone Forti’s solo work (which I also encountered in New York) and Bruce Andrews and Sally Silvers’ collaborative work being the other two (4). JR: You also collaborate with a singer musician and a dancer. Can you talk about that process? 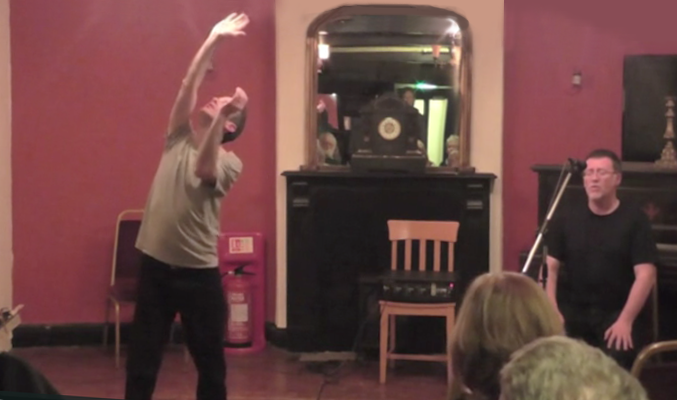 ST: I met Steve Boyland in a Contact Improvisation class in Liverpool in 2012. He was offering singing lessons, which I thought might help my poetry performances, and in fact we did mostly voice-work with text when we started – which involved taking the unusual step for me of memorising my poems! Steve’s always been interested in poetry and had been moving in that direction independently, so there were very ripe conditions for collaboration and we’ve now done about six performances together. Basically the dynamics are various combinations of working with improvised abstract voice, textual voice and movement. I’ve also been working with Sarie Mairs Slee, my colleague at the University of Salford, for over a year and a half now. Sarie is a mover, director and musician, and we are basically doing lots of studio-based work developing a methodology for bringing poetry and movement together in such a way as to try to avoid it sounding dramatic! We are also working on the basis of the fact that we both move and we both write – so we are each able to meet the other in their ‘base’ practice, as it were. We did a six-day studio intensive last summer which we’re still picking over the bones for an AHRC bid we’re working on. At its most exciting we were starting to feel we had a way of relating movement and text when we are both moving and speaking at the same time that is more than the sum of its parts. JR: What ultimately do you want to achieve in these collaborations? ST: It’s hard to know exactly – we keep following threads, ideas and instincts and responding to materials, situations and spaces that life throws our way. Steve and I recently met with a set designer who specializes in projections, which could add a really exciting aspect to our work. With Sarie I think there is the ambitious but genuine possibility that we might be able to generate work that will effectively sit inside its own new transdisciplinary art form! But that might take a while yet. Aesthetically I think what both collaborations have in common is an interest in extending the range of expression beyond what might be normally acceptable within the avant-garde contexts in which we have our roots – whether that be the free improvised scene that Steve has worked in, or Sarie’s work in Polish theatre, or for me in the innovative poetry scene in the UK. I have done many poetry collaborations over the years, but there is something different about working specifically on projects that will work primarily as performances. When I began my formal research in earnest in 2011, I thought it was all going to be about movement. I’ve certainly done that, but what has been of equal importance is the whole notion of performance and what that means when you get beyond the very narrow confines of the conventional poetry reading. It’s been an exciting and exhilarating ride, and it’s not slowing down! 2. I got really interested in gesture when I had the opportunity to participate in a symposium called ‘Extending Gesture’, co-curated by Tami Gadir and Fiona Hanley at the University of Edinburgh in 2012. My essay ‘Poetry Movement Gesture’ (published in The Wolf magazine and on academia.edu) sets it up a bit. Photo credit: Still from video recorded by Lyndon Davies of a performance at the Hen and Chicks pub in Abergavenny, 13 May 2014. Thanks to the organiser Ric Hool.